THE Milton-based Marchello Racing Team (MRTeam) has enjoyed another successful outing, this time at Goulburn’s Wakefied Park. Brothers Ryan and Reece competed in four events over the weekend as part of the second round of the NSW Motor Race Championship. Competing in the Improved Production Over 2L category in matching black Commodores, the boys demonstrated from the outset that they will be a force to be reckoned with as the season continues. Ryan finished the qualifying event 12th in a field of 20, recording a fastest lap time of 1:10.4642, with Reece close behind in 13th place with a fastest lap time of 1:10.9200. Reece turned the tables on his older brother in the first race of the weekend, finishing 9th out of a field of 19, finishing the 16 lap race in a time of 20:20.6602. He also improved on his fastest lap time, recording a 1:10.9195. Ryan worked his way down to 10th position but came off the track on round 10 in a controlled drift. He finished in 14th position in a race time of 20:39.6693 with a fastest lap time of 1:10.9773. The racing continued on Sunday with Ryan finishing the 10 lap second race in a time of 15:01.441 with a fastest lap time of 1:11.1748. Younger brother Reece finished in 16th position with a race time of 15.15.0922 and a fastest lap time of 1:10.3550. Reece had actually worked his way down to 8th position and was challenging for seventh when the safety car came out. The safety car left the circuit with only one lap to go in the race.He took the inside line on turn one for an overtake but was cut off. Both cars were went into the second turn with too much speed and hit the dirt, leaving them at the back of the back for the start of the third and final race. The two brothers finished their weekend outing in impressive fashion,with Ryan finishing his 14 laps in 8th position out of a field of 16 with a race time of 16:48.8743 and a fastest lap time of 1:09.9643. Reece finished his 13 lap times in 10th position with a race time of 15:47.6898 amd a fastest lap time of 1:10.6271. The Marchello boys were extremely pleased with their efforts. “It was very close racing,”Ryan said this week. “Competitors were quite evenly matched within their groups in the field.” Reece agreed. “There is still so much potential for the cars and for us as drivers.” Proud dad and team manager Terry Marchello said overall it was a great weekend for the team. “We ran close to our targets considering the tyres were getting quite worn,”he told the Times. He said the team hadn’t purchased new tyres for the weekend because of a need to upgrade suspension on the two vehicles and to run new 050 tyres. 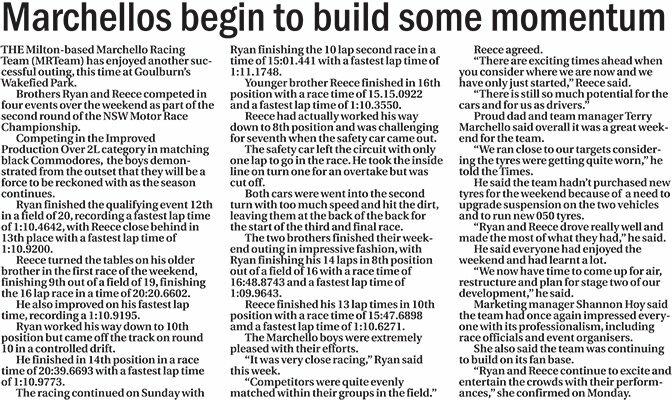 “Ryan and Reece drove really well and made the most of what they had,” he said. He said everyone had enjoyed the weekend and had learnt a lot. “We now have time to come up for air, restructure and plan for stage two of our development,” he said. Marketing manager Shannon Hoy said the team had once again impressed everyone with its professionalism, including race officials and event organisers. She also said the team was continuing to build on its fan base. “Ryan and Reece continue to excite and entertain the crowds with their performances,” she confirmed on Monday.